So, I was sent this book a fair while ago now by Ed Quigley and I must say it falls into the second category – it’s great. I suppose I could leave the review there but to give the author a bit of value for money I must write more I suppose. 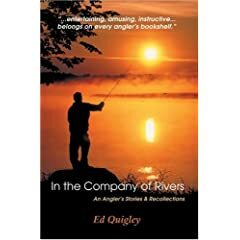 The title of the book is “In the Company of Rivers: An Angler’s Stories & Recollections” and it pretty much sums up what the book is about – Ed’s adventures fishing around the world. It is pretty entertaining stuff as he has met some interesting people on his travels. I smiled wryly about when came fishing to Scotland; I have fished the rivers he mentioned and he summed it up pretty well what kind of time can be had drinking whiskey with the locals. I see he has acquired a taste for 10 year old Macallan whiskey something I started enjoying on a recent trip up north. I like the way Ed writes, short sharp paragraphs (a bit like a poem) – every one has something to say and there is no filler material. My one regret with this book is that I did not get it to read during the close season – it is a perfect book for those winter nights when you feel a thousand miles away from fishing. I am one of these people who read fishing story books again and again. Saying that though, I am pretty sure it will be added to my reading list again for this coming winter as it is a book you can dip in and out of as the mood takes you. It will have a permanent spot on my bedside table. I suppose a Macallon whiskey would be much the same thing as a Macallan whisky, eh ? Thanks for that Davy !! !